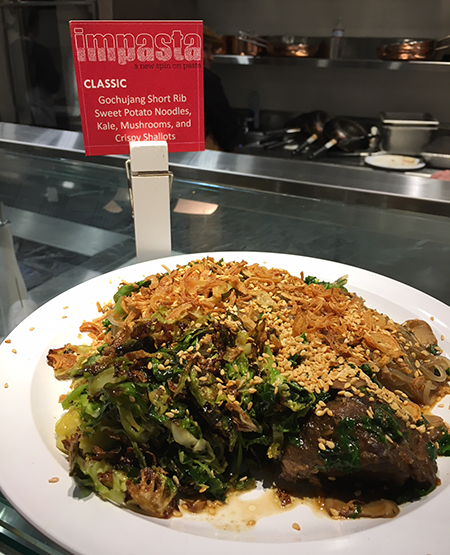 Customers are clamoring for this new noodle concept, which trades wheat for veggies and gluten-free options. It’s tough to find a person who doesn’t love pasta. But even the most diehard noodle eater probably isn’t a fan of that heavy, sleepy feeling that comes after enjoying a big bowl. Foodservice contractor Restaurant Associates has a new concept that gives customers the pasta fix they crave—without a side of sluggishness. 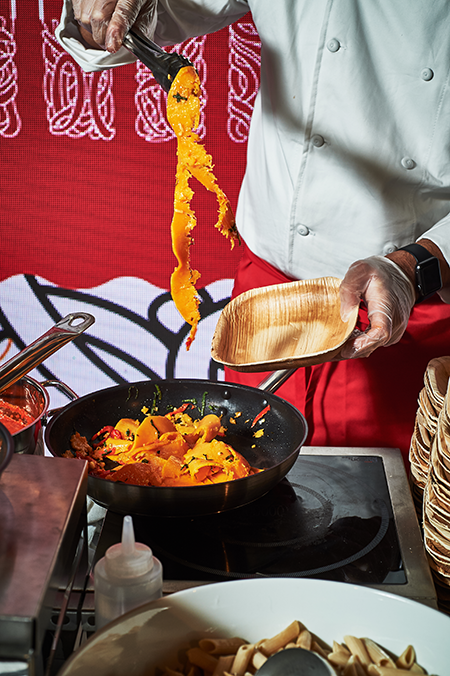 Impasta (which stands for Imposter Pasta) food stations offer cooked-to-order noodles made from wholesome ingredients like spiralized vegetables as well as gluten-free flours. Instead of the usual white flour bowties or spaghetti, Impasta serves lower-calorie, nutrient-dense options like “spaghetti” made from zucchini, carrots or golden beets, and “pappardelle” made from butternut squash. Guests can also opt for pasta made from high-fiber alternative flours, like chickpea or brown rice flour. The noodles are tossed with healthier, of-the-moment add-ins like fried Brussels sprouts leaves, sautéed mushrooms and kale, walnut mushroom ragu or crispy eggplant. Most customers say that they want healthier dining options. But prior to the rollout, there were some concerns that the dishes, which are largely plant-based, might be perceived as too healthy. Instead of driving away the skeptics though, hungry guests are flocking to Impasta. Covers for the action stations have increased by as much as 30 percent in some units. “I was at an account in the Boston area one day that offered small plates of the carrot, turnip, & zucchini spaghetti with walnut mushroom ragu and fried Brussels sprouts, and the cook almost couldn’t keep up with demand,” Crutchfield says. Restaurant Associates attributes Impasta’s success to more than just a basic desire for healthier fare, though. Spiralized noodles are also a big trend, and many shoppers are coming across prespiralized vegetables at the grocery store. “I’m willing to bet a fair number of people have been wanting to try them at home, but may not have wanted to buy a spiralizer or didn’t know how to cook prespiralized vegetables. So trying it at our cafés probably appealed to a number of guests,” Crutchfield theorizes. And while plant-forward eating has become more popular among Restaurant Associate accounts, serving vegetables in pasta form also makes the concept feel familiar to guests who might still be wary of plant-heavy dishes. Not to say that Impasta’s offerings are entirely vegan—far from it. Classic pasta pairings like Parmesan, ricotta and butter are still frequent add-ins. And a few of the dishes include some meat, like the golden beet, zucchini & carrot spaghetti with brown butter and turkey Bolognese or the sweet potato noodles with gochujang short ribs, kale, mushrooms and crispy shallots. But using animal-based ingredients in smaller quantities helps keep the dishes light overall. It helps keep costs down too. Thanks to factors like creativity and overall presentation, Restaurant Associates is able to charge between $9.25 and $10.95 per dish. “That’s a great margin for a vegetable-based dish,” Crutchfield says. Despite the obvious nutritional benefits of Impasta’s dishes, Restaurant Associates has stayed away from making specific health claims or touting the dishes as gluten-free. Instead, they focused on promoting Impasta as a cool, trendy, delicious concept—and let guests make their own decisions.